When Disney recently acquired Star Wars it set off a disturbance in the Force among the collective fan base. Filming of the next installment in the movie series has wrapped and Marvel is busy launching several Star Wars titles. The main question on everyone’s mind: Will they be any good? 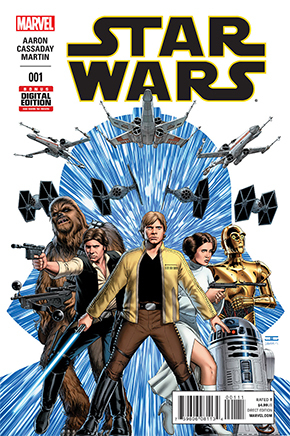 Not too surprisingly, the first issue of Star Wars, written by Jason Aaron and drawn by John Cassaday, has already surpassed 1-million copies through retailers, comic shops, and other outlets. The story takes place between A New Hope and Empire Strikes Back with all the well known players: Han Solo, Princess Leia, Chewbacca, R2-D2, C-3PO, a young Luke Skywalker, and the man who “killed his father,” Darth Vader. But with this story, readers will be there while the characters are discovering well-known secrets for the first time. Cassaday’s drawing is on point; everybody looks like they just stepped off the screen and “acts” like you’d expect them to. Cassaday’s color collaborator, Laura Martin, does a great job making the world feel very naturalistic in its approach. Letterer Chris Eliopoulos does a great job convincingly differentiating the communication styles of an eclectic cast of characters. Star Wars #1 kicks off the beginning of Marvel Comics’ adventures with these characters, and February will debut Darth Vader #1 by writer Kieron Gillen and artist Salvador Larroca. It’s been revealed that these two titles have been closely plotted with each other and that fans will see a connection between the Star Wars and Darth Vader titles. 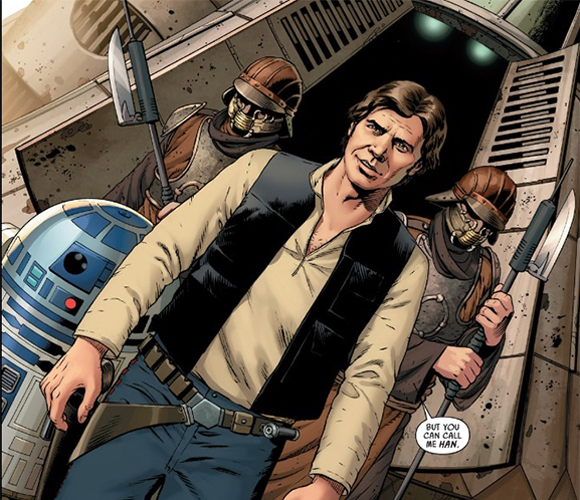 The success of Marvel’s Star Wars brand hinges not on whether the plot flows without continuity issues, but on the small details, such as whether we hear Harrison Ford’s voice when we see Han Solo’s face. All in all, this series makes for the perfect jumping-on point for people who have been fans of the Star Wars comics their whole lives, as well as people who have never read a single issue.